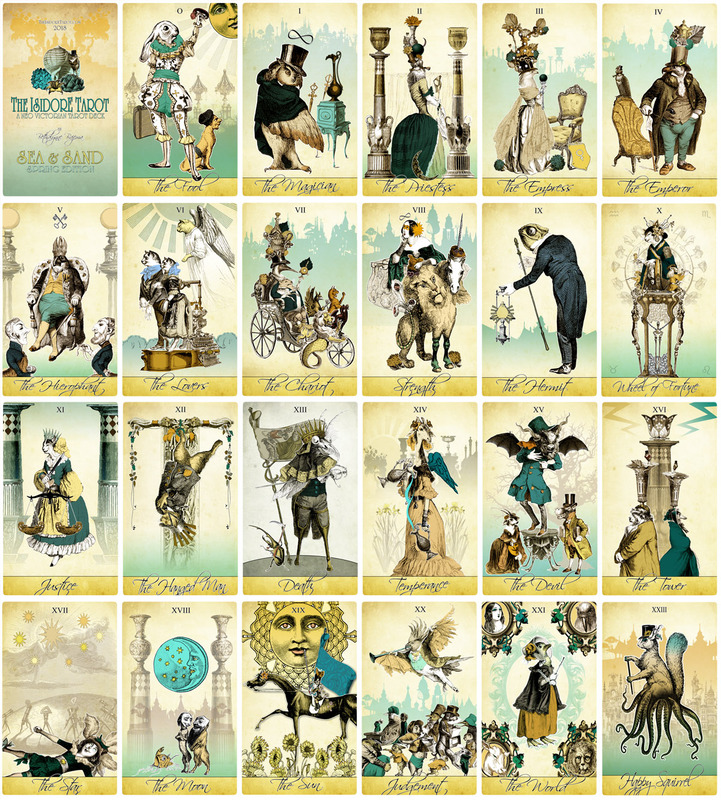 The Sea & Sand Isidore Tarot Spring Edition | The Attic Shoppe Trading Co.
ABOUT THIS DECK: The Isidore Tarot Deck is an art collage style tarot that uses whimsical vintage illustrations by J.J. Grandville to recreate the symbolism of the Rider-Waite-Smith tarot deck. Grandville’s characters are turned into new characters with the aid of Victorian era ink illustrations and our shoppe artist’s own pen-work to complete the collages. Each card is given a light color tinting to finish the piece. The idea for the style is based upon Max Ernst’s Une semaine de bonté collection. ABOUT THIS EDITION: Our favorite color palate is crimson and soft gold, only challenged by our love of watery blues and sand colors. And so we bring you the alternative version of the Isidore Tarot for spring: The Sea and Sand Edition. For this edition our shoppe artist went through and put a fresh tint on the major arcana and increased the blues and golds throughout the minor arcana. The minor arcana has also been touched up to bring out those colors. The art for this deck is based on the full bleed of the Isidore third edition. It also features the new Happy Squirrel card. This is not a limited edition, though it is only offered seasonally for a limited time. When available you can find style/ordering options here. The Isidore Tarot has a life of its own, so of course it started out with its own site! Visit TheIsidoreTarot.com to see all its editions & notable moments!